Revival on Lincoln is part of a larger restoration initiative in Bellevue. The restaurant took over a grand three-story, single-family home built in 1902, perched royally on the neighborhood’s main drag. In April, renovations began, transforming the mansion into a full-service fine-dining establishment. Bellevue is still climbing out of prohibition, which officially ended for the borough in 2015. Acquisition of a liquor license has proved difficult, but things are slowly changing, as evidenced by Revival on Lincoln and the upcoming Lincoln Avenue Brewery. The 116-year-old building is eye-catchingly beautiful. Wooden-carved hawks perch over the building's front yard, like gargoyles but much less threatening. Floodlights accentuate ruby-red walls and ornate pillars that mark the restaurant’s entrance, a small-scale Pantheon. A brass-handled door opens to a poinsettia-festooned front room. There’s no mistaking that Revival on Lincoln was once a home. Rooms are separated by half-walls and doorways. A huge staircase leads up to a dark hallway. It has the comfort and confusion of a grandmother’s residence, with irregularly shaped mirrors and gaudy Christmas trees sprinkled through the rooms. At the same time, it has the air of a luxurious movie from the ‘50s. When I sat, the dining room was bustling. Holiday parties filtered in with festively wrapped presents. Cackles erupted over gag gifts and white wine. The dinner menu was labeled “supper,” another grandmaternal touch. I opted for a brown butter curry cauliflower salad, chorizo meatballs, and shrimp and smoked cheddar grits. The salad presentation was odd. Cauliflower was covered by a pile of arugula, hiding the sauce, and showered with melon-balled cucumber. Once I found all the parts, I was impressed. The cold cauliflower was sufficiently spicy, with a touch of nuttiness from the brown butter. Lemon aioli was perhaps the best part, bringing a nice balance to the peppery arugula. Similarly, sauce starred in the meatballs. It was an ancho chile cream, packing heat with a touch of chocolate. The chorizo was lost in the meatballs but saved by the flavorful sauce. My main course, shrimp and grits, was surprising to find on a Pittsburgh menu. Good grits don't typically travel this far north and often tastes like scrapple. As a whole, the dish was incredibly rich. The grits were lush, creamy, and cheesy. Five perfectly cooked shrimp rested on top with sherry glaze, caramelized onions, roasted tomatoes, bacon, and a poached egg. The yolk broke with cinematic perfection, melting into the rest of the dish. But I was left wanting just one more texture, something with a crunch. To end, I tasted a dark chocolate bread pudding. I wanted the pudding for breakfast, not dessert. It was basically a thick, square version of a chocolate chip pancake. 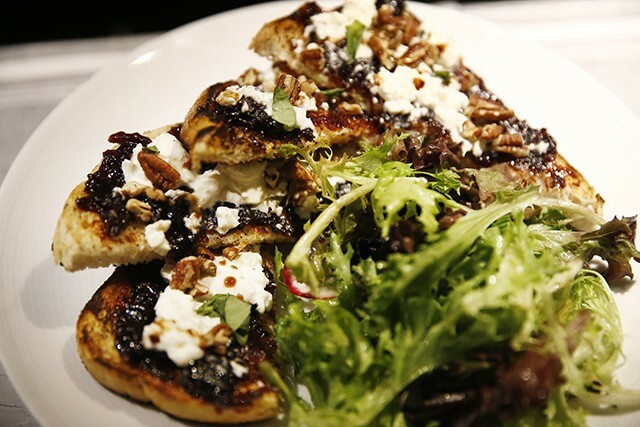 Revival on Lincoln may be a bit kitschy, but the food is pretty delicious. The restaurant, soon to be a nationally recognized historical building, brings a breath of fresh air for a forgotten neighborhood. 1. Fireplace made of glass-A blue glass fireplace was the cherry on top of Revival on Lincoln’s strange decor, completely conflicting with the sleek, regal dining room. 2. House-sized bathroom-Whoever said the building was built for a single family was fooling themselves. The bathroom was as big as my current bedroom. Revival is mysterious, dark, and probably haunted, the ideal place for a game of hide and seek. 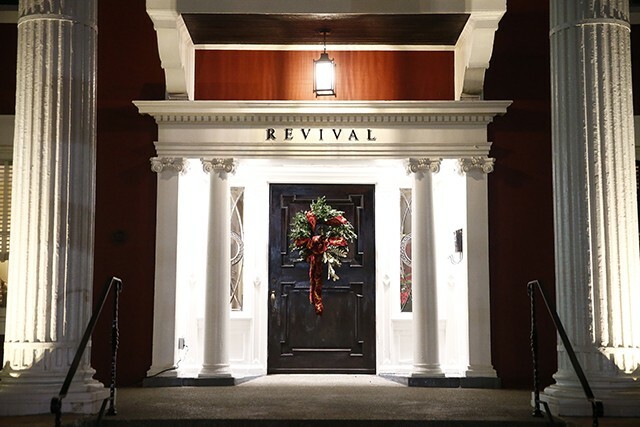 The child in me wanted to run around Revival at full speed, poking my head into all of the rooms and hallways, to find the perfect hiding spot. Tue.- Fri., 4-10 p.m.; Sat., 10 a.m.-2:30 p.m., 4-10 p.m.; Sun., 10 a.m.-2:30 p.m.